A four-sided frame of boards with a removable glass or plastic top. 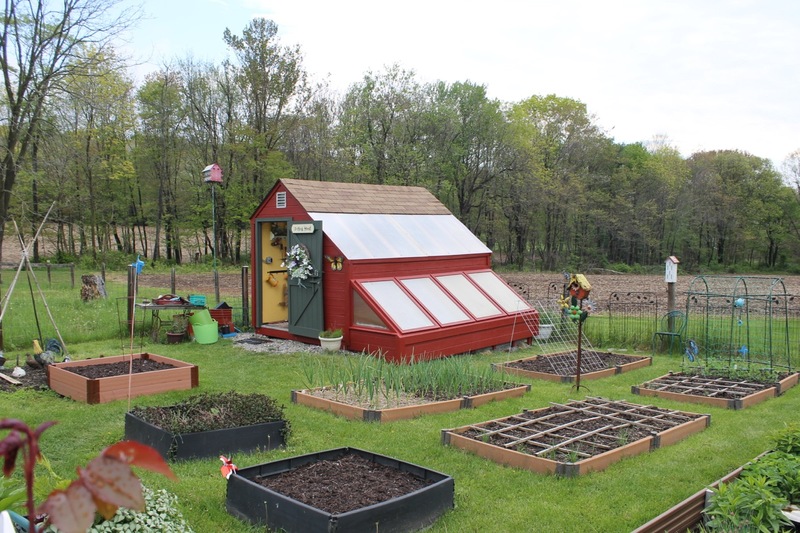 The frame is placed on the ground and is used to house, protect, and harden off seedlings and small plants, without artificial heat. 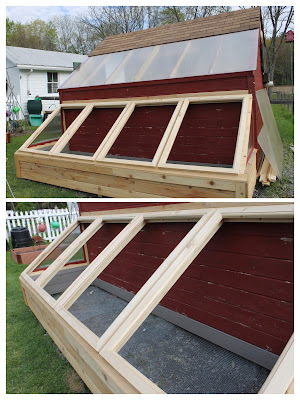 I've wanted a cold frame for a long time but never imagined I would own such a grand one. 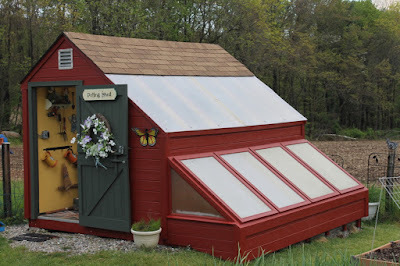 Years ago, I coveted a potting shed/greenhouse combination I spotted at one of the big box stores. 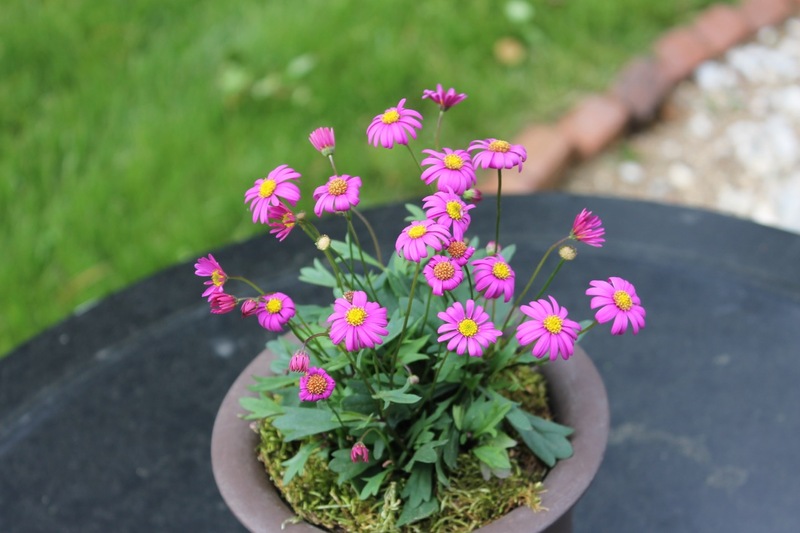 We purchased it and placed it as the focal point of my yet-to-be-planned-and-planted kitchen garden. 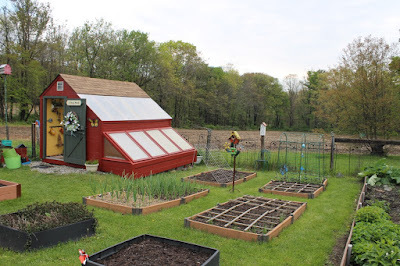 We built raised beds around the shed (we couldn't plant directly into the ground with the proximity of a walnut tree and its toxic roots) and eventually added fences. My kitchen garden took shape. We added a picket fence on two sides and a pasture fence on the other sides. Over the years we made important changes to the inside of the potting shed. H.H. 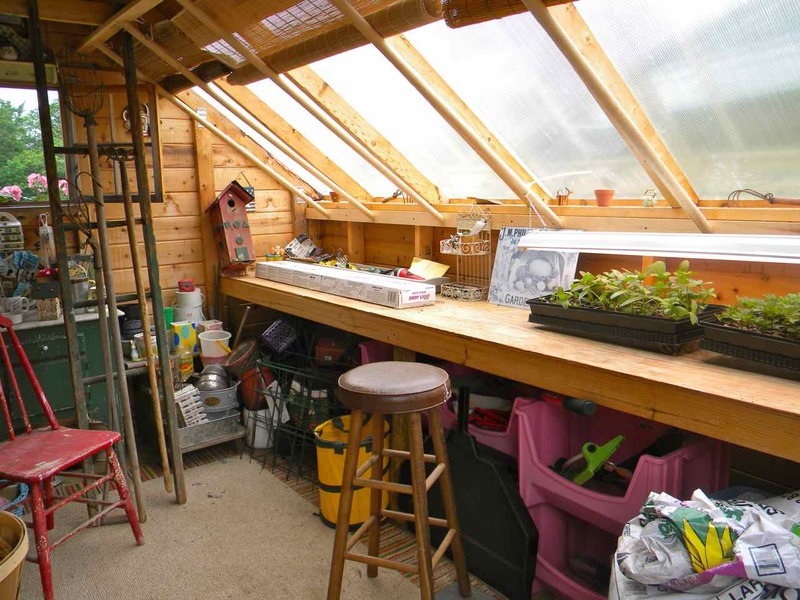 hung shop lights with grow lamps over the potting bench for my trays of seedlings on sunless days. We added a framework to support roller shades of bamboo for too-sunny days. Always wishing to extend the growing season, we added insulation to the potting shed so that I could put seedlings (that I start in the house) out in the shed a little earlier. 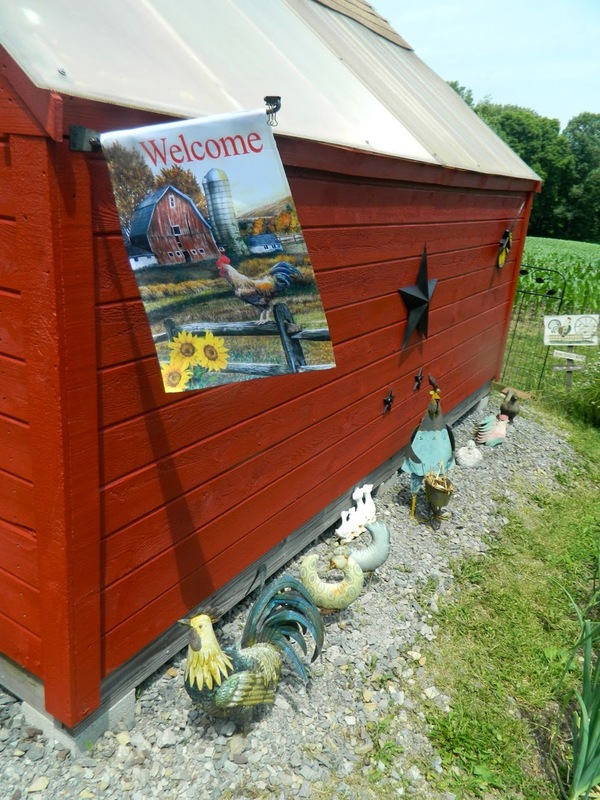 I painted the inside a sunny yellow and added treasured items from the attic of our 1850's farmhouse. Purdy's rocking chair is a family piece probably more than a century old. I painted the shed a barn-red color, added some chickens (H.H. 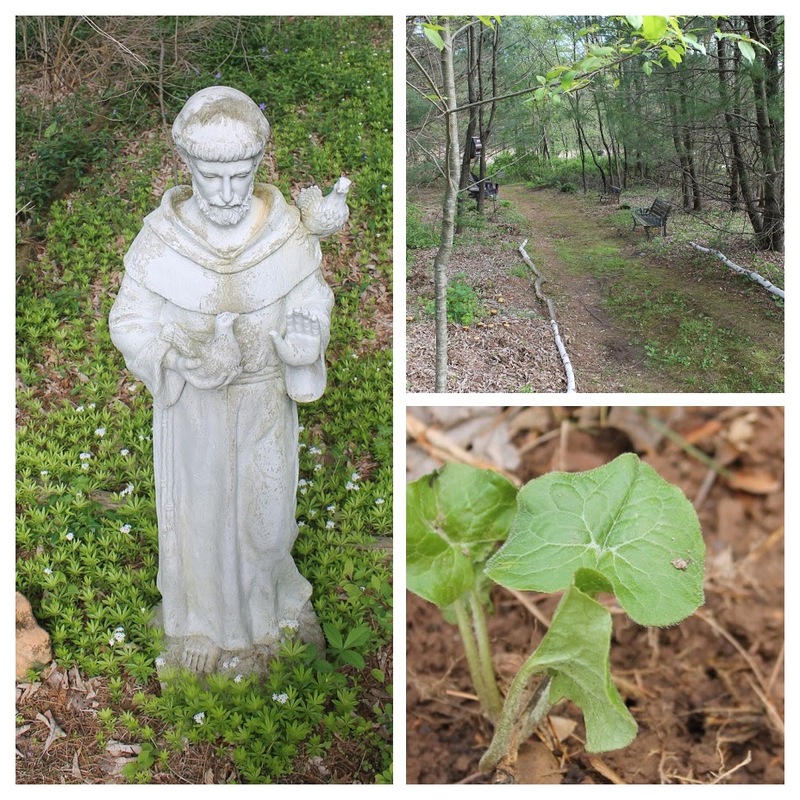 wont let me keep real ones because of the foxes and coyotes that inhabit our fields and woods) and I was content ... for a time. 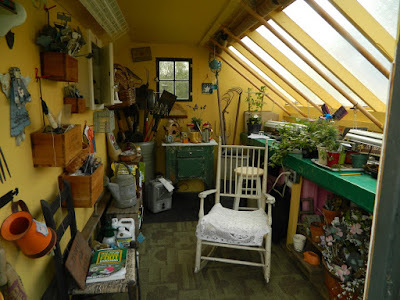 I love my potting shed and have written extensively about it over the years. You'd think I would be satisfied, wouldn't you? But I saw a cold frame at the Bloomsburg Fair last year and started reading about winter gardening with cold frames. 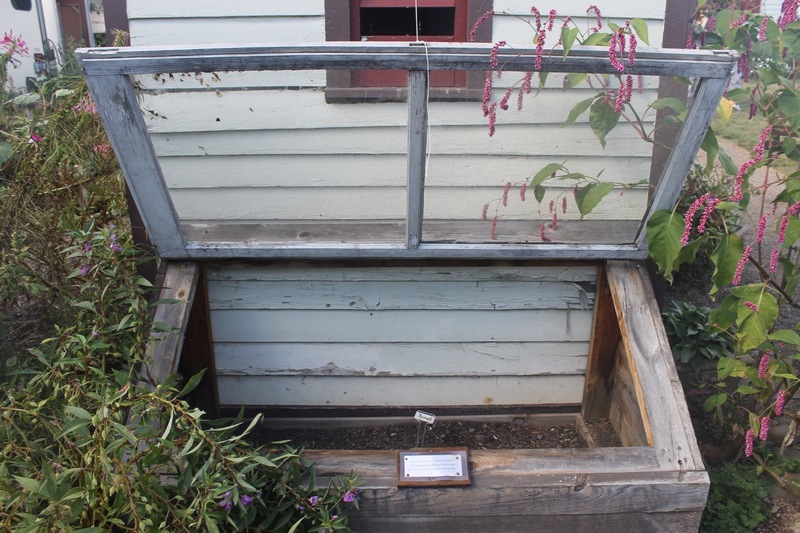 I pictured my seeds sprouting in a warm protected enclosure; my tender seedlings kept safe from wind and frost. 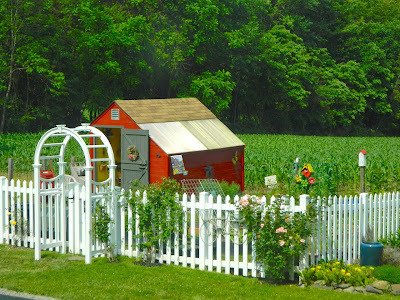 I visualized a simple box structure, maybe topped with old windows, like the one at Bloomsburg. Then I talked with Victor. 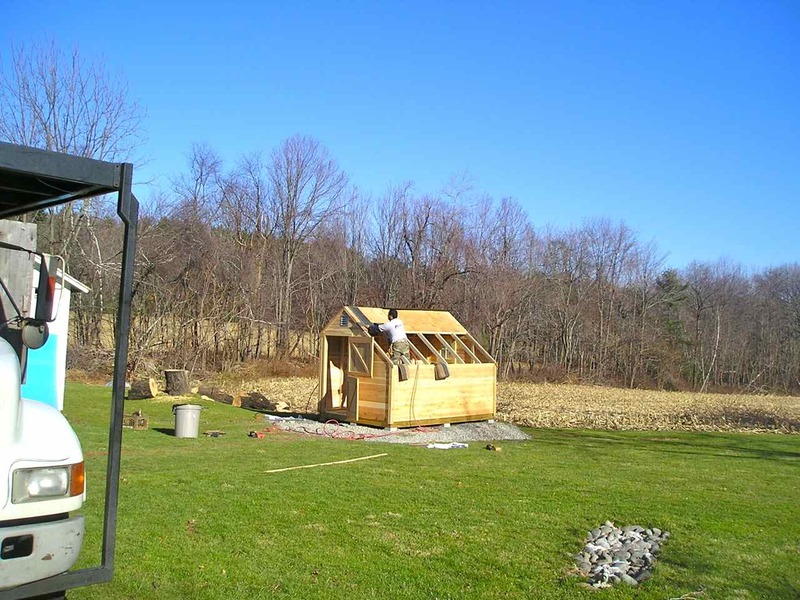 The son-in-law of a dear friend, Victor is a musician, photographer, graphic designer, owner of a small construction/renovation company, and (cold frame) visionary. I told him I would like my cold frame attached to the south side of the potting shed. We discussed materials (non toxic, of course), size, and pitch of the roof. The latter proved to be the critical factor in making the add-on look part of the original building and, incidentally, very attractive. Victor felt the pitch of the cold frame's roof should match that of the shed/greenhouse structure. He was right! 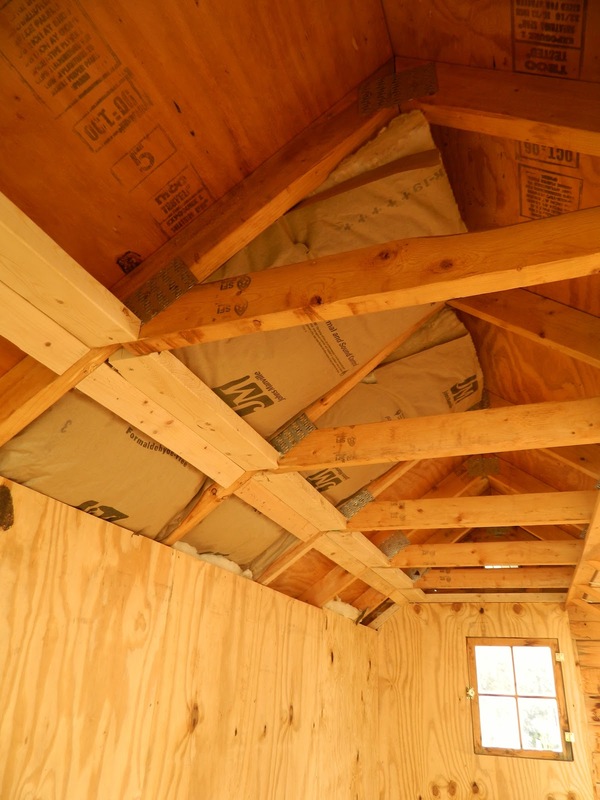 Victor used cedar wood that he insulated and lined with a composite material. He put wire mesh in the bottom to keep out critters. 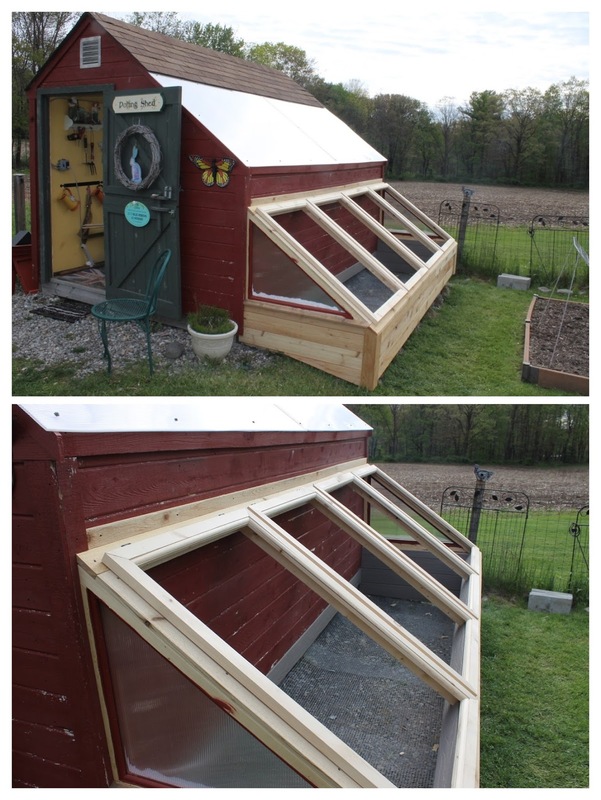 Victor made four separate 'lids' covered with the same plastic material as the roof panels -- called Lexan®. The lids are very light and attached with lift-off hinges so I can remove them easily. You may notice in the picture above that Victor also replaced the rotting logs that bordered the long lasagna-garden on the extreme right. 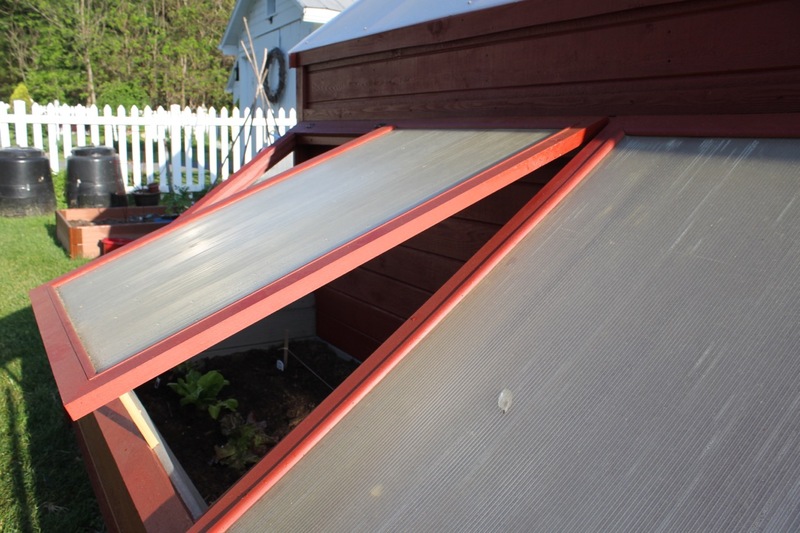 He used the same composite that lines the cold frame. 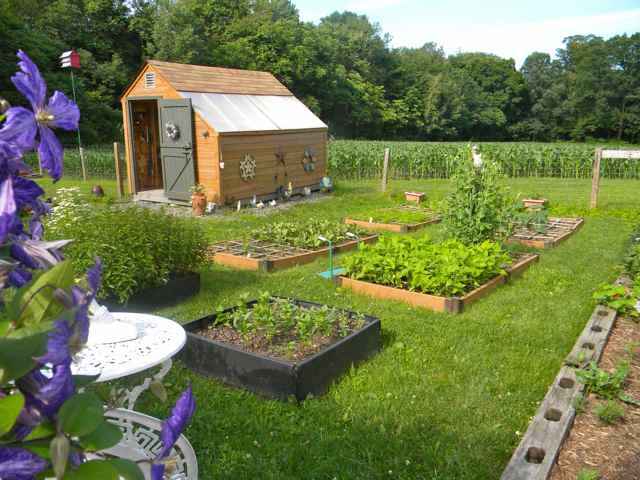 Now my kitchen garden, with all it's new construction, is very snazzy! 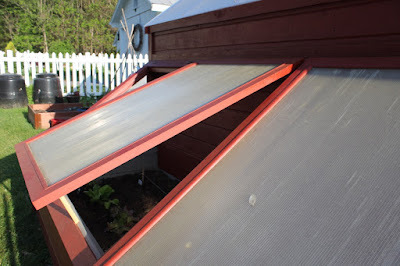 Obviously, the cold frame will come into its own at each end of the gardening season. 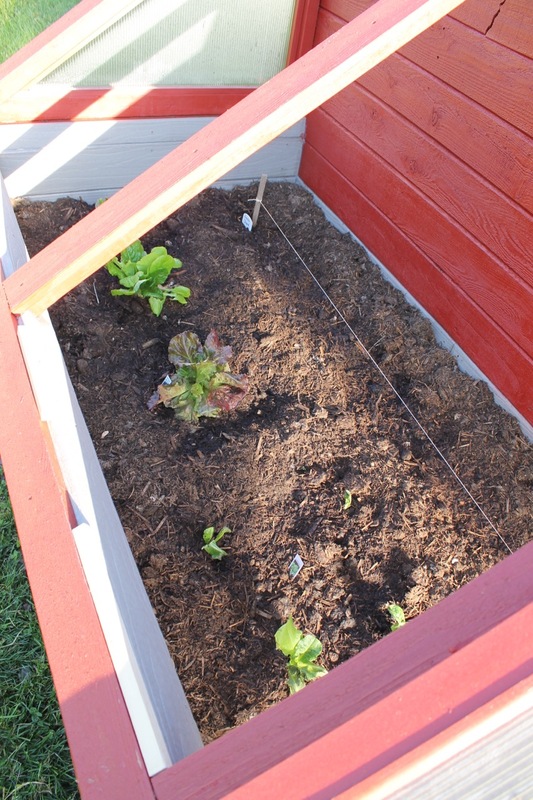 I plan to get a jump start on my spring garden by planting cabbage, chard, kale, radish, spinach and, of course, lettuce, in late winter next year. 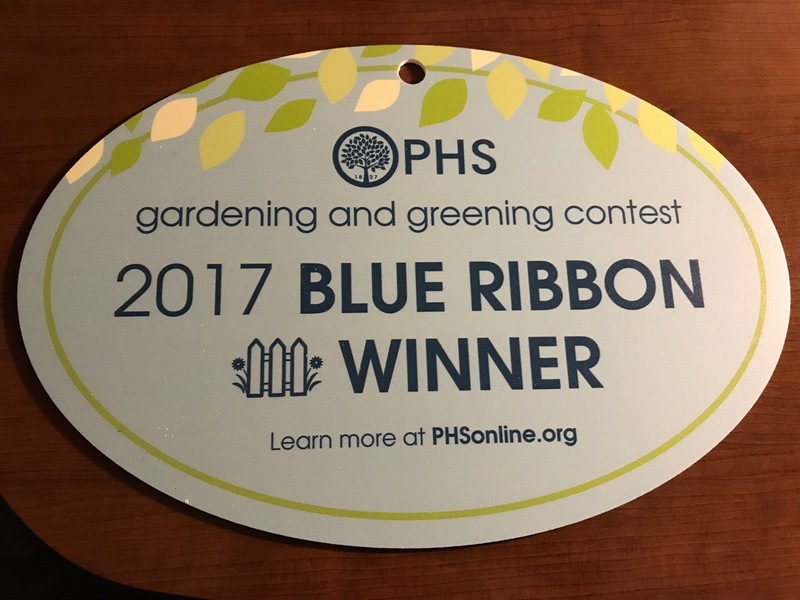 This should add more than a month to my spring garden season. 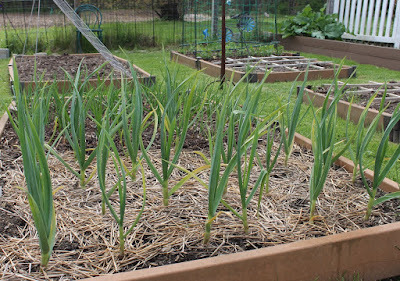 I dread the coming of the first fall frost and look forward to planning how I will extend this year's growing period. Thank you, Victor. I love it! 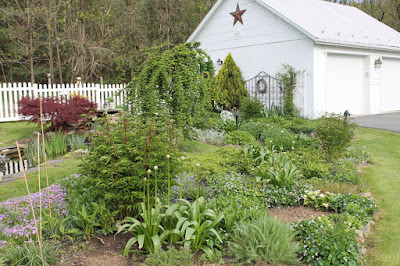 Now I trust I've made some of my dear gardening friends green (appropriate color) with envy. Please check out Victor's website by clicking here. He enjoyed the challenge and would love to make more. Clockwise from top left: bridal veil spirea, bleeding heart, lily of the valley, daffodil, allium. 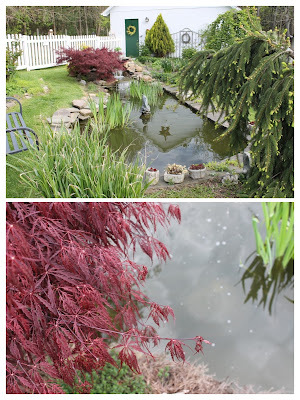 My best-loved season is spring and May is my favorite month in the garden. 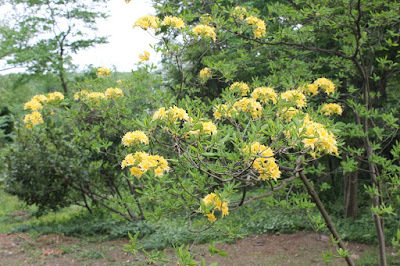 Every day I discover a new bloom; the perpetual renewal never becomes boring. 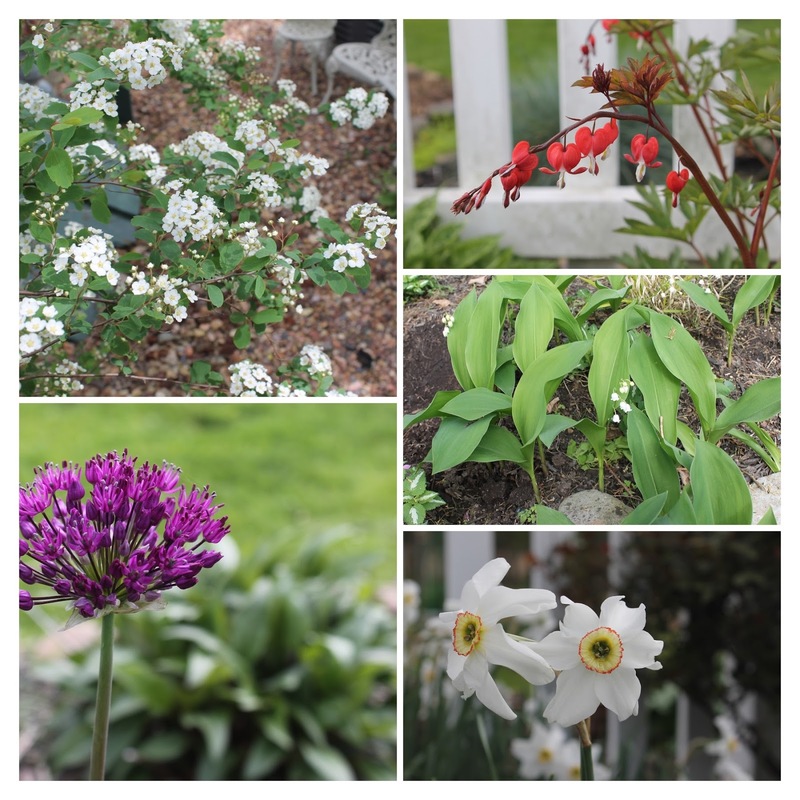 Today, I find bridal-veil spirea full of its delicate, lacy, white blossoms; there is more of Connie's sweet-scented lily of the valley among the lady's mantle; bleeding heart is stunning; and a few daffodils are clinging to the season. My biggest surprise is the purple allium in the butterfly garden: a surprise because I don't recall planting the bulbs last fall. Oh dear, my age is showing, but May always promises surprises. All seems possible in May." 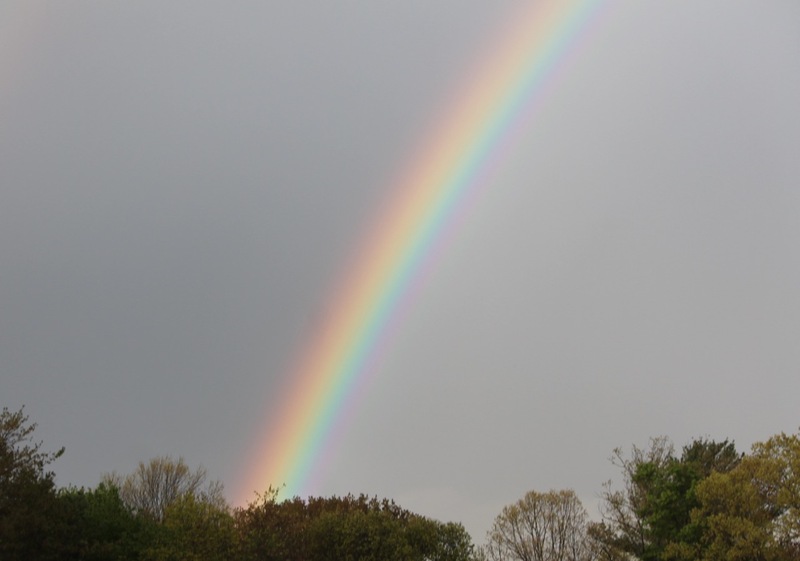 As is often the case at this time of year, the weather has been very unpredictable. 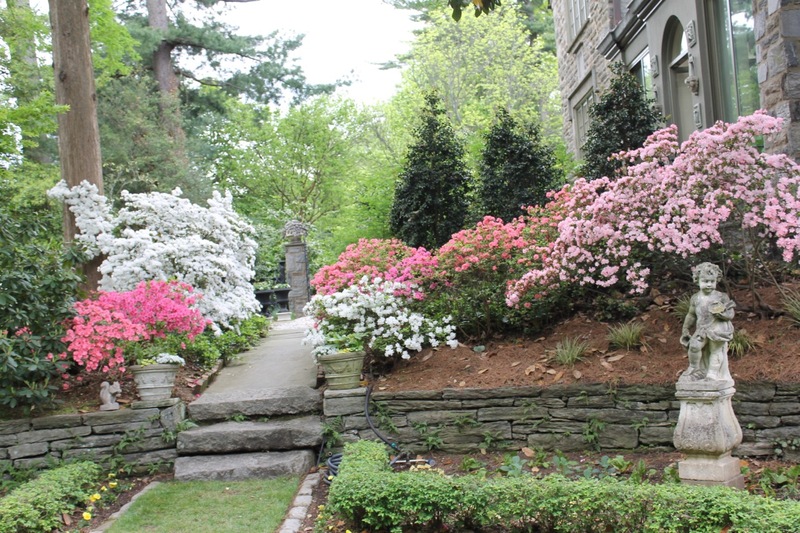 Mark Twain famously said, "In the Spring, I have counted 136 different kinds of weather inside of 24 hours." This is true of the past several weeks; heavy rains and high winds have not been unusual and some days have been too cold for me to venture outside. As a result, I am somewhat late in completing my spring tasks this year. 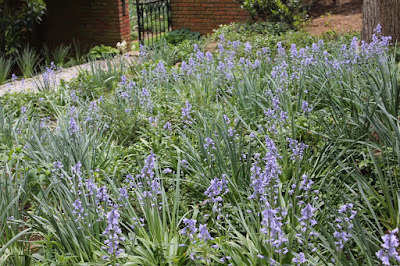 But the garden didn't wait for me; it looks beautiful anyway especially since I gave all the beds a (late) mulching. 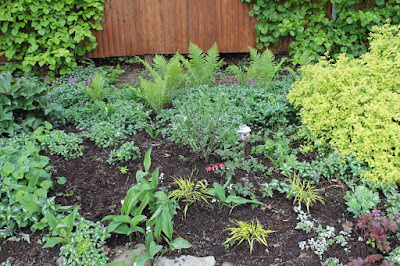 The Cottage Garden before I mulched with compost. would be better off with a few clothes on." Weeping Japanes Maple by the waterfall is the star of Froggy Pond. At the entrance to my Tranquility Garden, the viburnum is about to burst into bloom. This former shade garden is undergoing a transformation due to the felling of the large white maple. 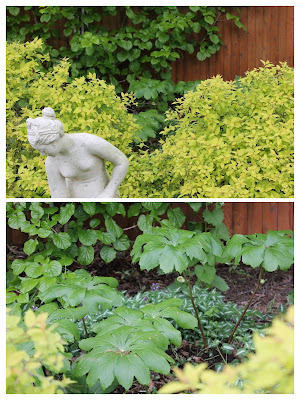 I removed the hostas, brunnera, hellebores and astilbes from the area because it now receives more sun. 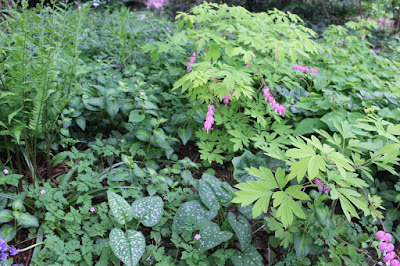 I've left similar plants, however, in spots that I think will continue to have enough shade. 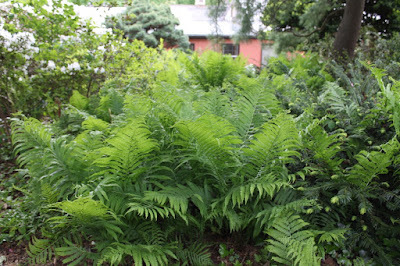 I didn't remove plants from this side of Serenity Garden as it is still shady. 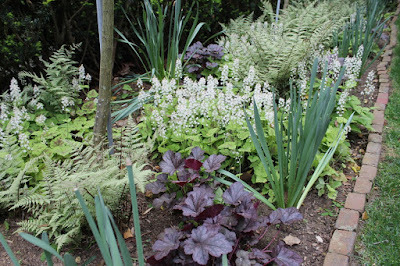 A mixture of shade and sun plants. I'm waiting to see how Serenity fares this summer. 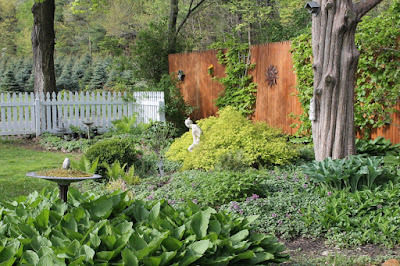 I doubled the size of the foundation bed across from the Serenity Garden and placed the shade-lovers there. 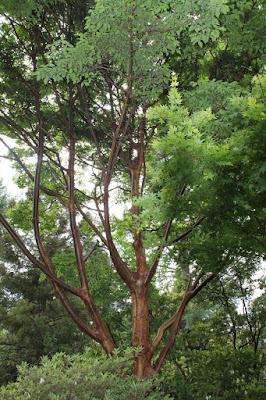 I am hoping they will receive enough shade in the afternoon from the catalpa tree when its large leaves develop. If not, they must go to the Woodland Walk. I added a recently acquired bloodroot. The Woodland Walk is looking lovely. To mark the path, H.H. placed branches from our beloved white birch that the wind blew down. St. Francis on a carpet of sweet woodruff; wild ginger bottom right. 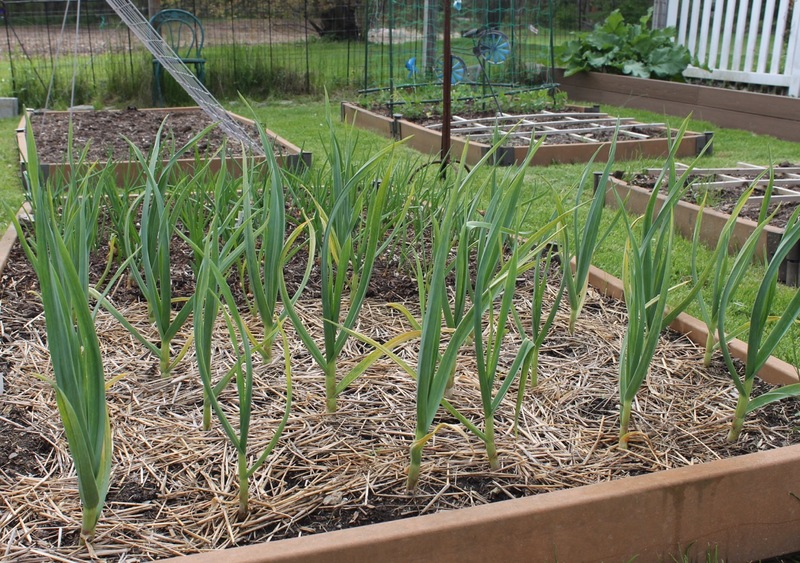 The kitchen garden displays all the promise of the new gardening season: peas are coming up, garlic and onions are green. All the beds are mulched with mushroom compost ready for planting. Next time I'll write a Kitchen Garden update and tell you about my new coldframe extension on the potting shed. It is amazing; I can't wait to show you. Today, it is very windy. 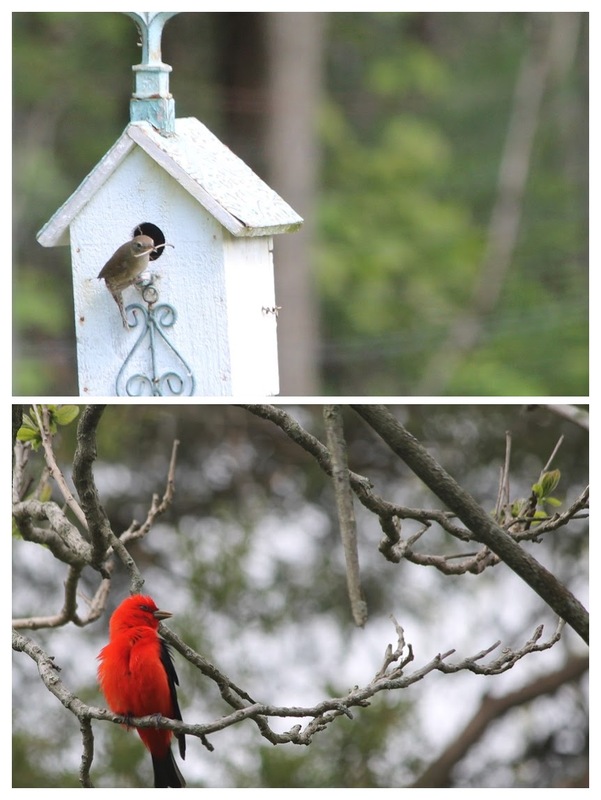 The birds are busy. Top - Carolina wren. Bottom - scarlet tanager. 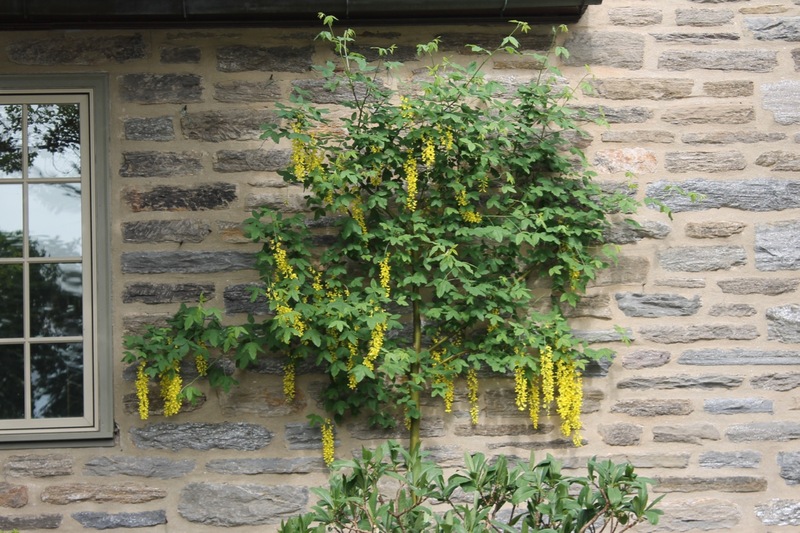 Forgive me for not giving botanical names but this is a late posting for Garden Bloggers Bloom Day and I don't want to delay it further. (If you don't recognize a plant let me know in a comment.) 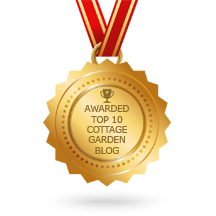 If you haven't yet visited Carol's blog at May Dreams Gardens, please do pop by to see what is blooming around the world today. I'm off there now. Happy May, dear gardening friends. nine-tenths of the people couldn't start a conversation if it didn't change once in a while." 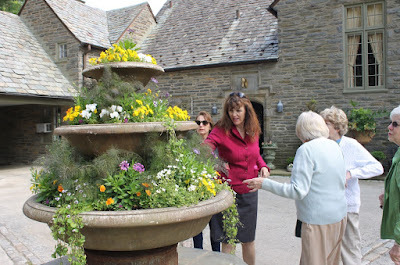 This is my third visit to Meadowbrook Farm in Jenkintown, Pennsylvania. 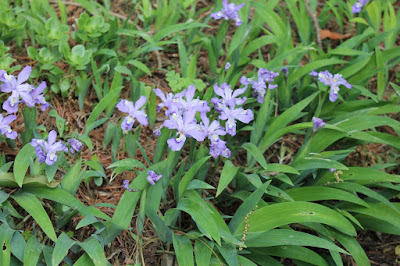 I've now seen three seasons of its beauty; I think spring may be my favorite. Click here for a description of my first visit last summer then compare the pictures with today's photographs. This time I am here for a wonderful event: we are celebrating the launching of Jenny Rose Carey's new book from Timber Press, Glorious Shade. 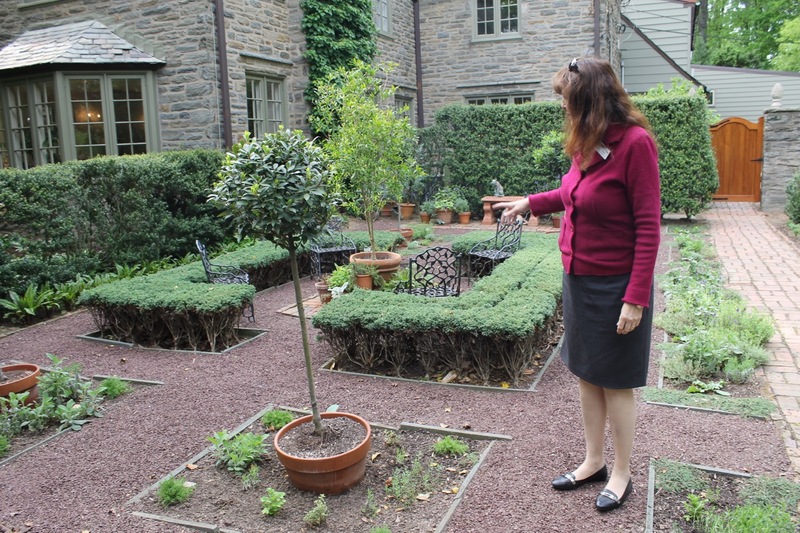 As readers of this blog know, Jenny Rose is the senior director at Pennsylvania Horticultural Society (PHS) Meadowbrook. 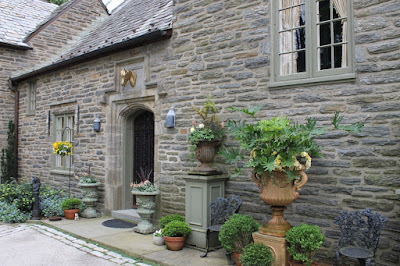 (You may have read my posting about The Philadelphia Flower Show in which I feature Jenny Rose. If not click here.) 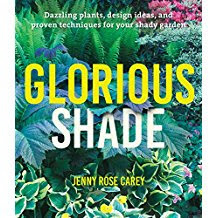 I received my copy of Glorious Shade a couple of weeks ago and I'm excited for Jenny Rose to sign it. 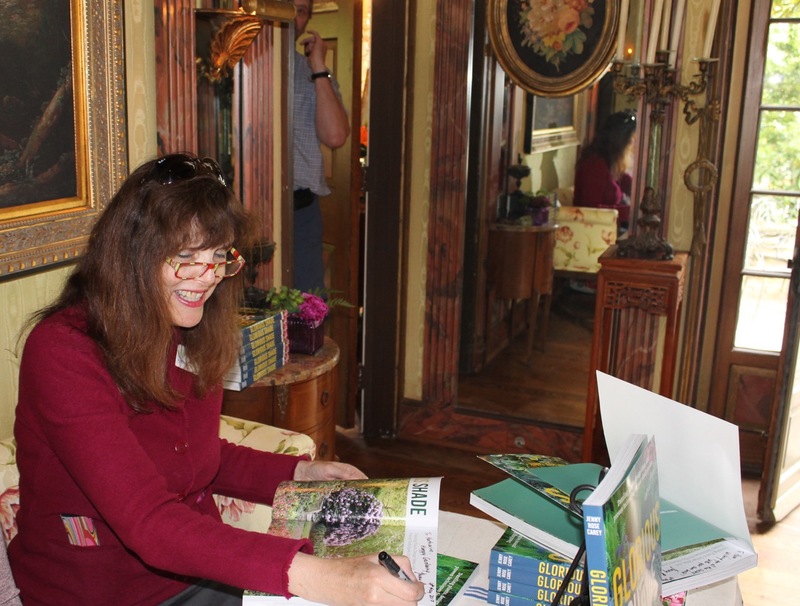 The book signing takes place in the lobby of the beautiful Pennock House. Following the book signing, Jenny Rose gives a brief, but informative, lecture. 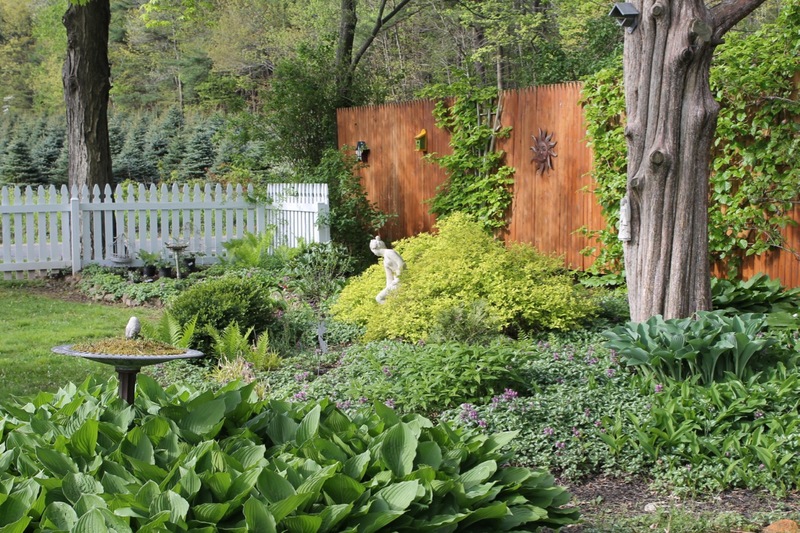 We enjoy cheese and wine then take a stroll, wineglass in hand, around the garden. I have illustrated the following review of Glorious Shade with pictures from our garden walk. 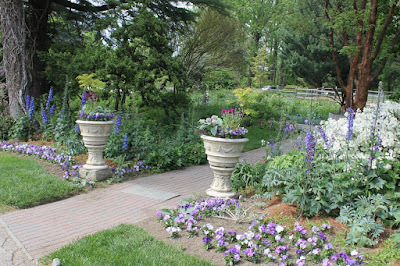 Note: my photographs are not intended to match my text, but are meant to give you a feel for the gardens as we walk through them. So pour yourself a glass of wine and meander with us. 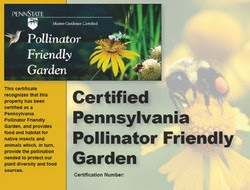 The book's subtitle says so much: Dazzling Plants, Design Ideas, and Proven Techniques for Your Shady Garden. The book is divided into sections, the first one stressing the importance of learning the shade patterns in your garden. 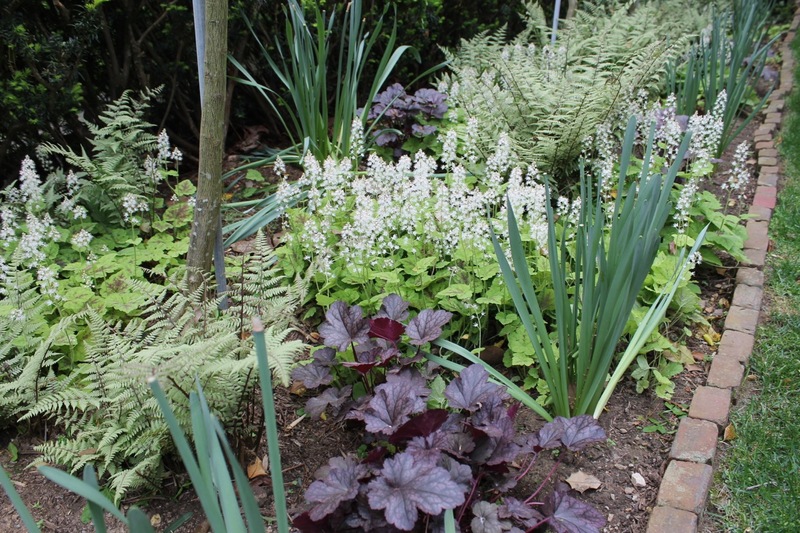 Jenny describes the various types of shade and the plants that benefit from each kind. I learned from this chapter that I should plant tough, drought-tolerant plants on the west side of my house because it now has morning shade only, due to the loss of the maple tree. 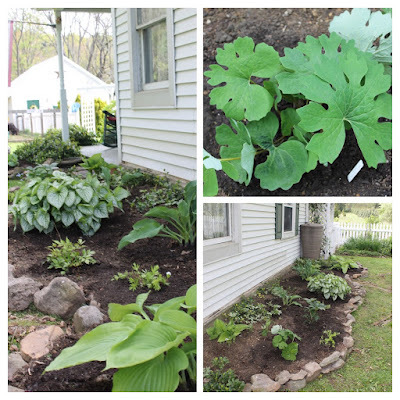 I am in the process of moving my hostas that grow there to an area with afternoon shade. 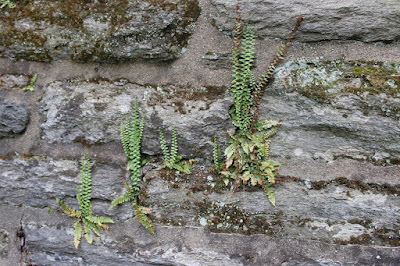 Fern maidenhair spleenwort Asplenium trichomanes grows in crevices. Jenny Rose telling us about the herb garden. Jenny Rose gives very inspirational descriptions of several design styles in her section called 'Designing in the Shadows: Bright Ideas for Shady Spaces.' She discusses woodland gardens, moss gardens, Japanese- or Chinese-inspired gardens, rock gardens, xeric gardens, tropical gardens, water gardens, walled or courtyard gardens, container gardens, and orchard gardens. Whew! 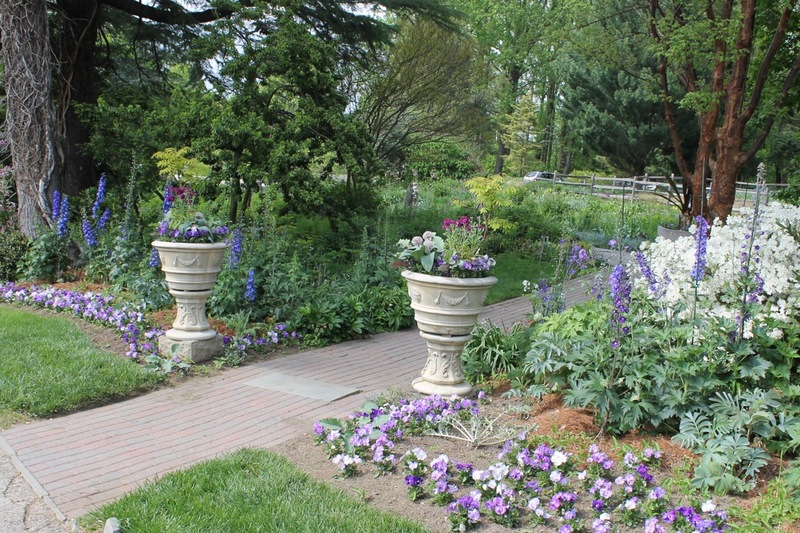 In this section she also talks about designing with paths and includes gardens that attract wildlife. My personal favorite is about designing areas for children and I love the whimsical tea-pot water feature she added to her own garden. There is a gardener's calendar in one chapter and numerous techniques and maintenance tips in another. The gardener's calendar describes the garden through the seasons with tasks for each one. I think this section is Jenny Rose's personal favorite. The maintenance chapter gives an in-depth guide to taking care of your shade garden. 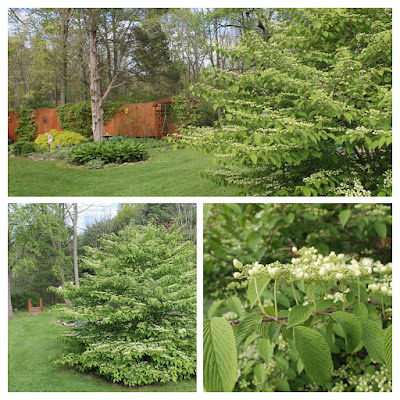 The final chapter tells you how to choose plants that thrive in the shade. 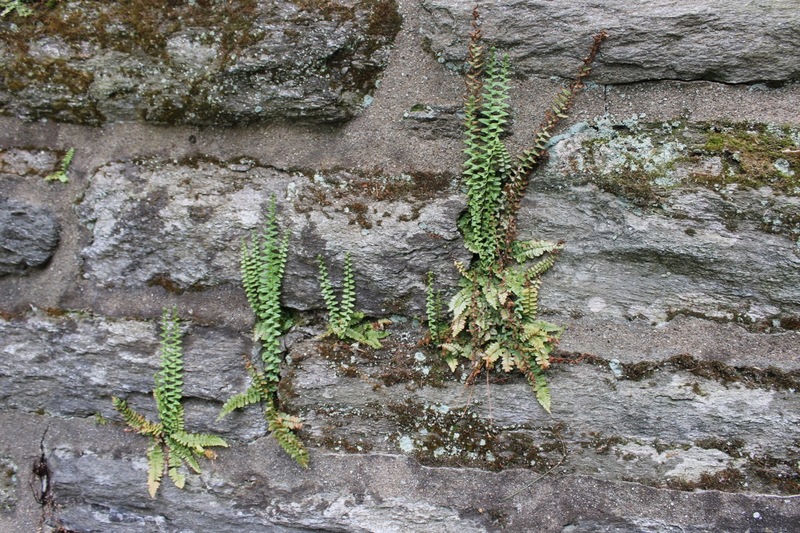 Jenny describes 200 genera of plants with photographs for each genus. Jenny Rose told me she took 35,000 photographs to get the 400 shown in the book. They are stunning. This week I purchased bloodroot Sanguinaria canadensis and wild ginger Saruma henryi; I added several other plants to my 'must-have' list. 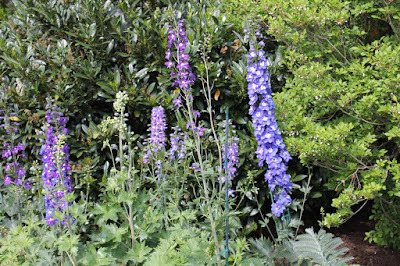 Delphiniums in springtime? Shh ...They were forced in the greenhouse. I love the 'substantial' feel of this volume with its glossy pages that are loaded with colorful illustrations. In this post, I touch upon only a small fraction of the valuable information that the book contains. In every chapter, the author's voice comes through as passionate, enthusiastic and inspiring. It is as if Jenny Rose is speaking to the reader one-on-one. Thank you, dear friend; I continue to learn from you. I enjoyed writing the review and hope you found it useful. I do hope some of you are inspired to buy Jenny Rose's book. Here is the link to Glorious Shade on Amazon. 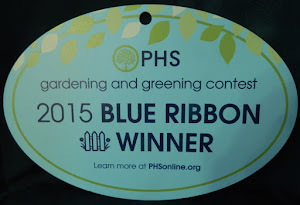 Next month I plan on reviewing some other recent additions to my garden library.